← 2nd Qtr Central Headlight is here. The NYCSHS has worked with TrueLine Trains by supplying detailed drawings and paint and lettering diagrams to develop this model. We have a project team that has worked with TrueLine Trains for the past several months to help bring this model to our members and the model railroading community. This is the second model in our continuing series of models sponsored by the NYCSHS and this is the one you have been asking for us to bring to you. As you can see in the ad details, this one has everything. It is being offered in a variety of paint and lettering schemes including two exclusive road numbers that will only be available through the Society. In order to make this model possible, we needed for you to give us an indication of interest by sending us a non-binding pre-order for these cabooses. The pre-order time limit has passed. If you are interested in purchasing one or more of these exciting models, you may still send us an email indicating the number of each of the models you would be interested in purchasing. There is no deposit required at this time. You will be contacted when the models are available for purchase. You will then be placed on a waiting list. When the models are produced we will determine if we can fill your order and you will be notified at that time. Please send an email to NYCSHS@comcast.net to give us your desire to be placed on a waiting list.. Let us know the number and type of each that you would be interested in purchasing in the following lettering schemes. Be sure to include your name and contact info. None of these cabooses will have the NYCSHS logo. They will all have prototypical paint and lettering!!!!!! Don’t be left in the yard without one of these accurate and detailed cabooses. You can still be placed on a waiting list. NYCSHS members will enjoy a 20% member’s discount on the final price. The SRP for these cabooses is SRP $44.95 and $35.99 for NYCSHS members. Shipping is $7.50 for each caboose. Ohio residents should add 8% for Ohio sales tax. Don’t send any money now. 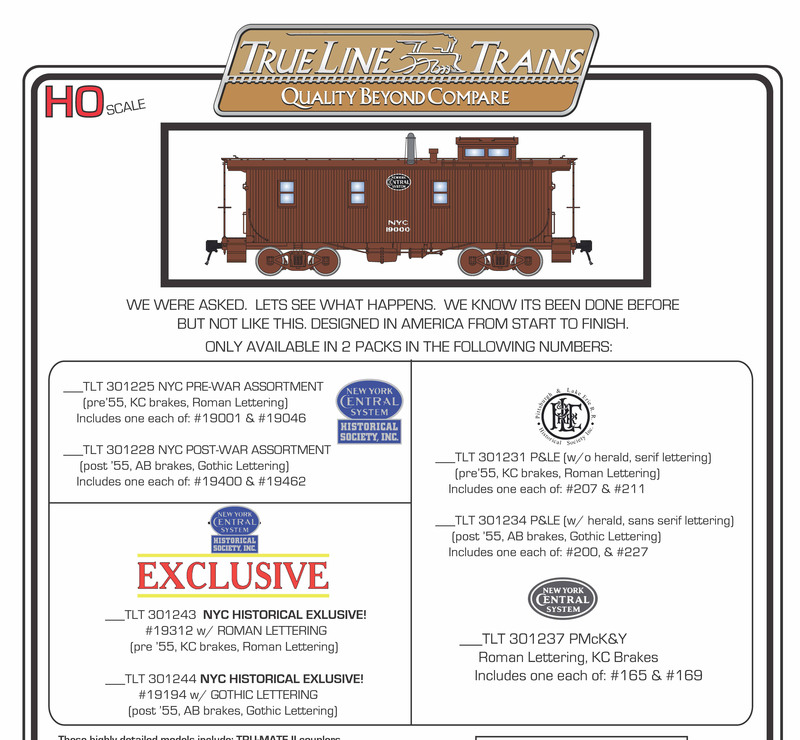 You will be notified when the cabooses are ready for shipment and you will be able to pay on our NYCSHS store or by check at that time. Watch us for additional NYCSHS models in the future.